It was the moment that the sociologist from University of Amsterdam Olga Sezneva announced “I will be a talking artifact” while striking a pose in the Allard Pierson Museum in Amsterdam that I knew our collaboration would work and that I was in the right place. The whole group burst into laughter and we continued our work of live performance in the museum engaging with the objects in the museum and also inserting our own objects into the exhibits. I had recently joined the Moving Matters group and was excited to bring my movement practices to the group at Susan Ossman’s invitation. 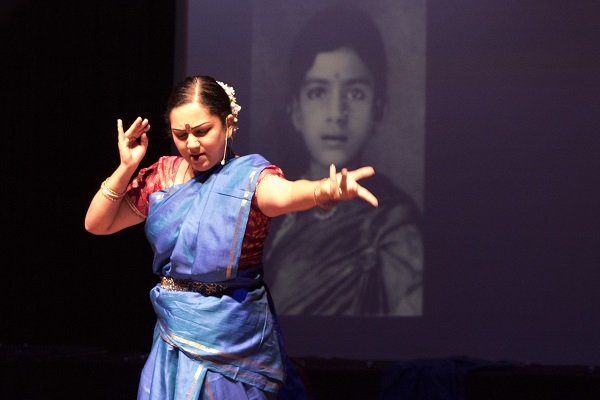 Although Susan had invited me to join the group in 2013 after reading my book Sweating Saris: Indian Dance as Transnational Labor, I could not do so because I was actually “serially migrating” from California to Shanghai and then to Rotterdam. But in 2014 I joined the Motley Crue group of visual artists, scholars, writers, and performers from different parts of the world in Amsterdam at the Allard Peirson Museum of Mediterranean Antiquities.